technology as per the global standards. Steel and stainless steel wall sleeves are generally built into walls, floor plates or ceilings during the process of shuttering. 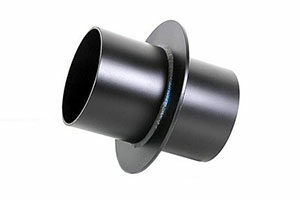 They are designed to take in seal inserts for pipe or cable penetrations. Stainless steel wall sleeves are mainly used in the construction of drinking water facilities, chemical facilities and sewage plants due to their high resistance to corrosion. lf corrosion resistance is not a main priority, it is more economical to use galvanized or plain black puddle flanges.Steel wall sleeves are often provided with a seamlessly or longitutal welded flange ring to secure them against water penetration caused by capillary action.